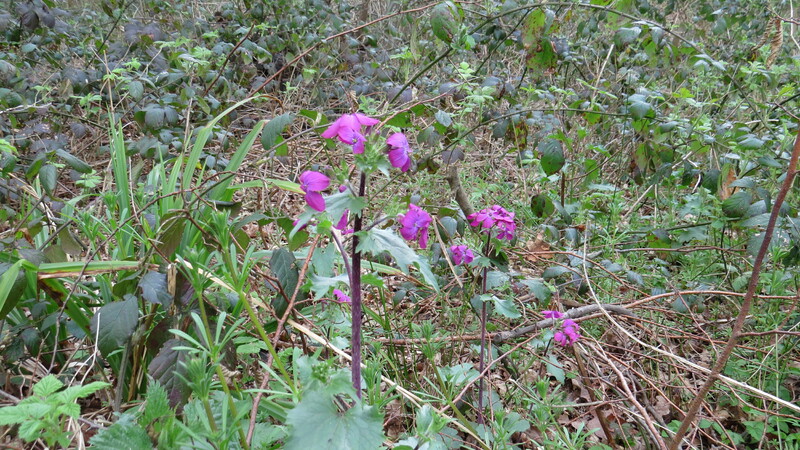 Dear Readers, on my way through Coldfall Wood last week, my eye was caught by a group of bright magenta flowers growing beside the stream. When I slithered across the mud to investigate, I was delighted to find a little group of honesty (Lunaria annua) in full flower. 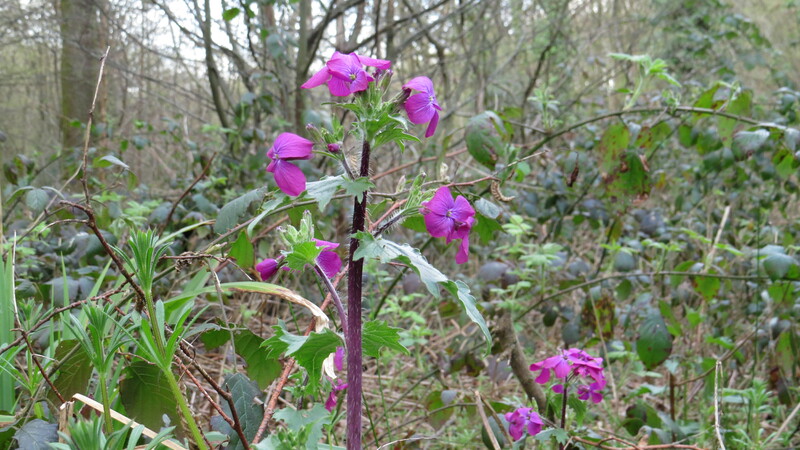 This is another of those plants that has probably escaped, either from the local gardens or from the cemetery, but it has been recorded in the wild since at least 1597 so it is a long-term inhabitant. Its native home is the Balkans and parts of south-west Asia. 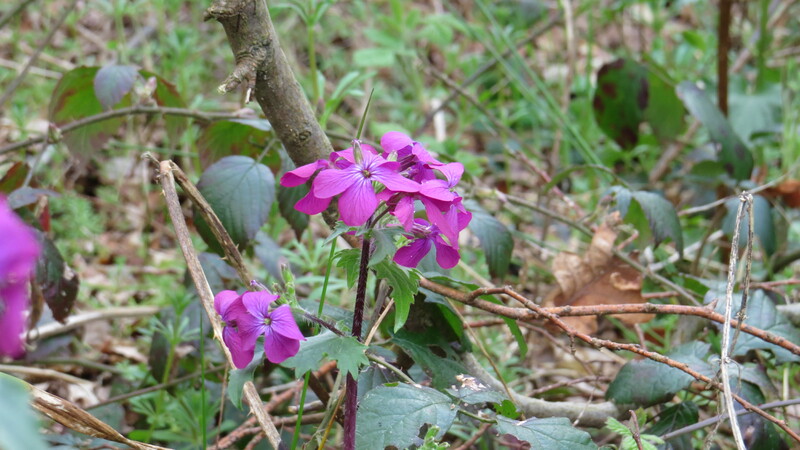 Who would have thought that this pretty plant is a member of the cabbage family (Brassicaceae)? And yet a close look at its flowers give us a clue. All members of this varied tribe have simple flowers with four petals and four sepals, and the cross-like arrangement is what gives the group its alternative name of crucifer. 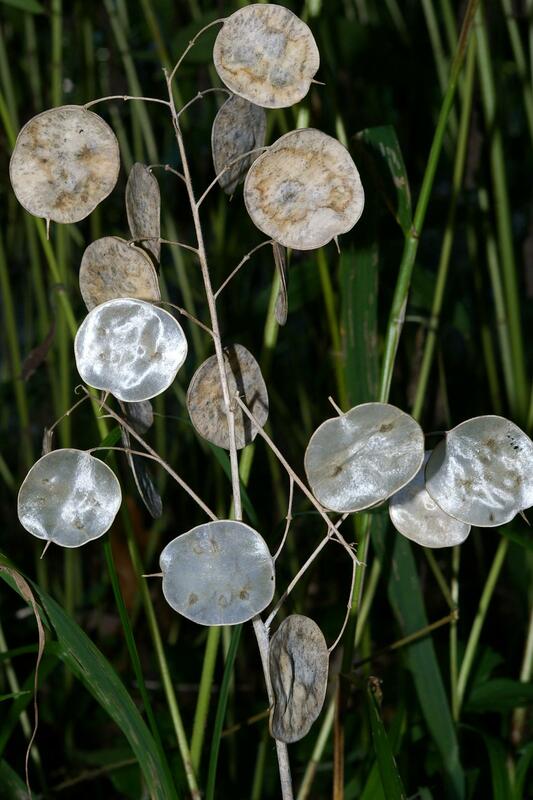 Honesty is probably more familiar from its seed-pods, whose semi-transparent nature are said to give it its English name. These are very popular in autumn flower arrangements, and also give the plant many of its alternative names: in south-east Asia it’s known as ‘the money plant’ and in the US it is known as ‘silver money’ or ‘chinese money’. In Dutch-speaking countries, however, the plant is known as judaspenning (coins of Judas), an allusion to the thirty pieces of silver Judas was given for betraying Christ. It is fascinating to me how a plant may have a reputation for plain dealing in one culture, and be seen as treacherous in another. 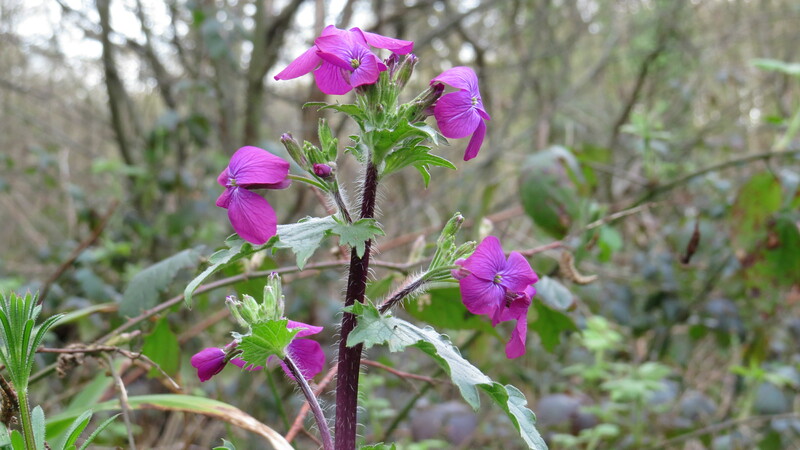 Even in the UK, the Plant Lore website reports that in Yorkshire, some people believe that the plant is very unlucky, and won’t have it in the garden or the house, while in Kent it’s known as ‘the devil’s ha’pence’. On the other hand, the Magickal Gardening website reports that keeping one of the ‘coins’ in the pocket will attract good fortune. I suppose that a plant with such evocative seedpods was going to attract all kinds of beliefs. In her book ‘Fifty Easy Old-Fashioned Flowers’, Anne M. Zeman tells us that honesty has been used to dress wounds, and as a cure for epilepsy. She also tells us that the roots have been used in salads since the 1500’s. Furthermore, other sources describe how the seeds can be turned into a kind of mustard if mixed with vinegar – this is not surprising when we consider that the cabbage family contains many other plants with this property, including Black and Hoary Mustard. Honesty, and in particular its seedpods, were very popular in the Art Nouveau movement, as in the illustration by Alfonso Mucha below (part of his 1900 precious stones series). The Precious Stones series includes Ruby (which features of all things a poinsettia), Amethyst (with some irises) and Emerald (with Tradescantia). Mucha was such a favourite in our house when I was growing up that we had his ‘Moon and Stars’ series framed in the hallway. I have always liked his graceful female figures, and the way that he included plants and other elements of the natural world, even in his posters for theatrical productions and such necessities as Moet et Chandon champagne. If you are ever in Prague, I can recommend a visit to the Mucha museum. Although his paintings are a little too fey for many people’s taste in this more cynical age, I think that there is always room for a celebration of lush beauty and the abundance of nature. In this age of austerity, it’s easy to forget how much there is to be grateful for. This entry was posted in London Plants on April 20, 2016 by Bug Woman.